Viewers are set to witness the story of two people who will strive to reach for their dreams and fight for their true love in ABS-CBN series “Ikaw Lang ang Iibigin,” featuring the most-awaited television reunion of Kim Chiu and Gerald Anderson. From “Sana Maulit Muli,” “My Girl,” “Your Song,” “Tayong Dalawa,” and “Kung Tayo’y Magkakalayo,” KimErald will once again grace the television screens as they play new roles that will surely leave a mark in viewers’ hearts. Fans should also watch out for the newest tandem of Jake Cuenca and Coleen Garcia set to add more excitement in the series. Kim and Gerald will play Bianca (Kim Chiu) and Gabriel (Gerald Anderson), childhood friends that are both determined to give their families a bright future. With her dreams for her family, Bianca aspires to become a triathlete to provide for their needs. Gabriel also carries the same aspirations, facing life’s struggles head on for his family. As they reach for their dreams, they also experience love for the first time together. However, they will eventually part ways as Bianca leaves their province to save her father’s life from his illness. As they live their separate lives, they will take on different journeys that will keep them away from each other. But love will reunite their paths as they once again see each other in a triathlon event of TigerShark, headed by Carlos (Jake Cuenca), the man who will come between their love. Being the number one triathlete in the country, Carlos is not used to failure and always seeks the approval ofhis father. To further ensure the success of his company, he hires Bianca as an endorser, but later on falls for her, despite his ex-girlfriend Isabelle (Coleen Garcia) being against with it. This sparks the battle between Carlos and Gabriel not only in triathlon, but also for Bianca’s love. Their fight for their love and dreams also gets even more complicated as secrets from the past threatened to destroy their love and their lives. 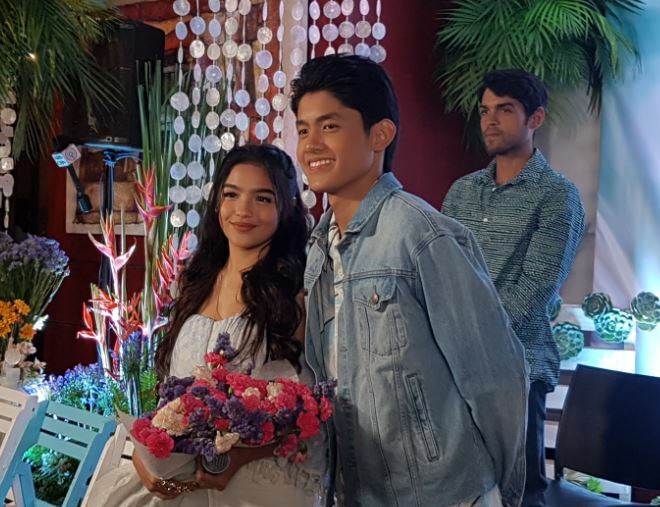 Will Gabriel and Bianca still be able to reach their dreams together? Can Carlos succeed in destroying their love for each other? Will Gabriel and Bianca be able to fight for their love and dreams? Also part of “Ikaw Lang ang Iibigin” are Gina Pareño, Bing Loyzaga, Ayen Munji-Laurel, Michael De Mesa, Daniel Fernando, Dante Rivero, Nicco Manalo, Ivan Carpiet, Andrea Brillantes, and Grae Fernandez. It is directed by Dan Villegas and Onat Diaz and written by Noreen Capili and Anton Pelon. Don’t miss the series that will show how people can fight for their love and their dreams, “Ikaw Lang ang Iibigin,” on ABS-CBN and ABS-CBN HD (Sky Cable ch 167).